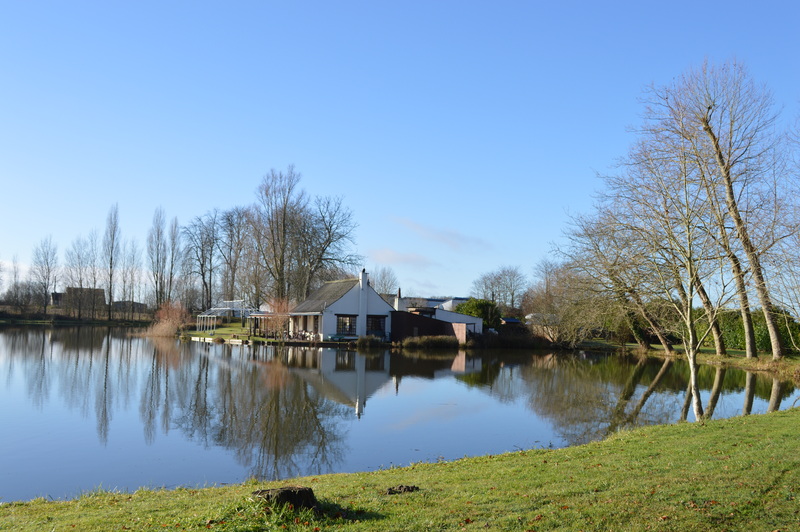 We have enjoyed five fabulously lazy days at this marvellous and peaceful carp fishing lake just north west of Chartres and it is with a heavy heart that we’ve just packed all the bulky stuff prior to our departure tomorrow. There are some places that you just simply don’t want to leave and this is surely one of them, so I expect we’ll come back next Easter. 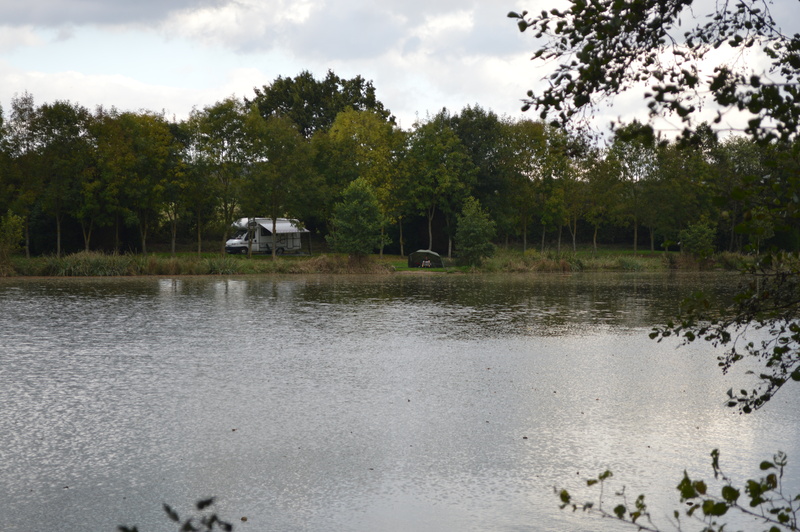 The pitches are enormous, at least 20 metres across and about 15 m. from the lake, so we estimate we’ve had 300 m² solidly for our use. There is also a hut with a shower and a toilet, both immaculately clean, and a sink for washing up with a hosepipe to fill up the tank. 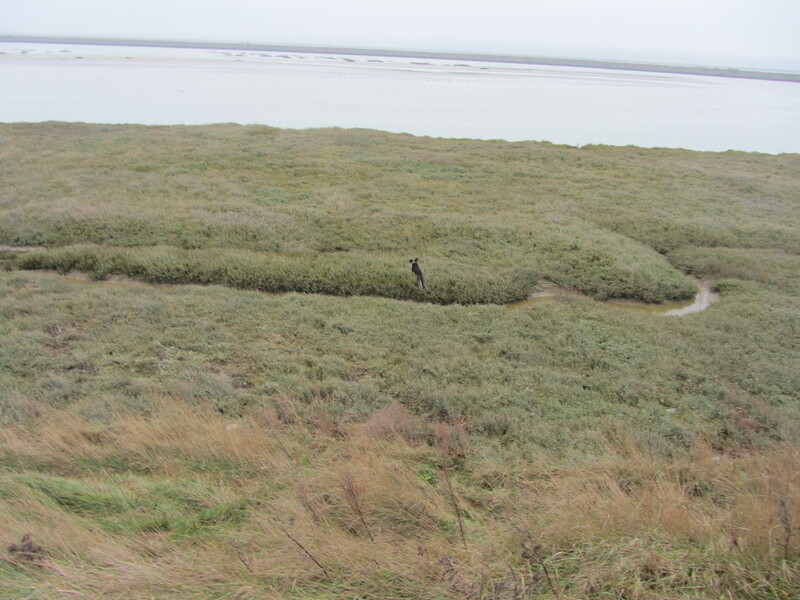 We have also benefited from a couple of very sunny days and just one rainy day and today has been overcast but warm. Adonis has caught 2 carp so far and he still has a couple more hours before tonight’s dinner, so he might yet catch another! All in all, it has been a wonderful 5-day break and we are already looking forward to our next visit. I developed a morning routine of walking Beano after breakfast, followed by a shower and a cycle ride to the village for baguette and croissants, which took me around 12 minutes each way, making that my daily exercise. 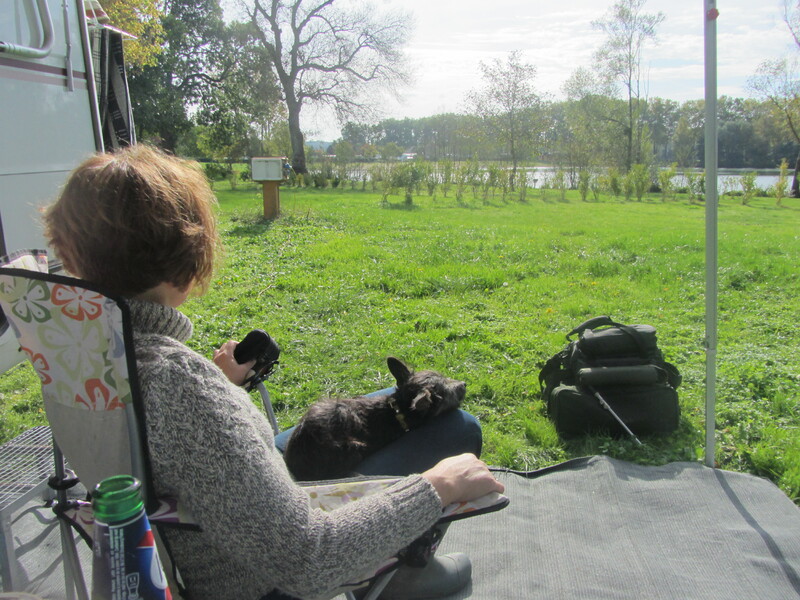 I really love the walk around the lake with Beano, watching the herons and the coots gliding in the water. 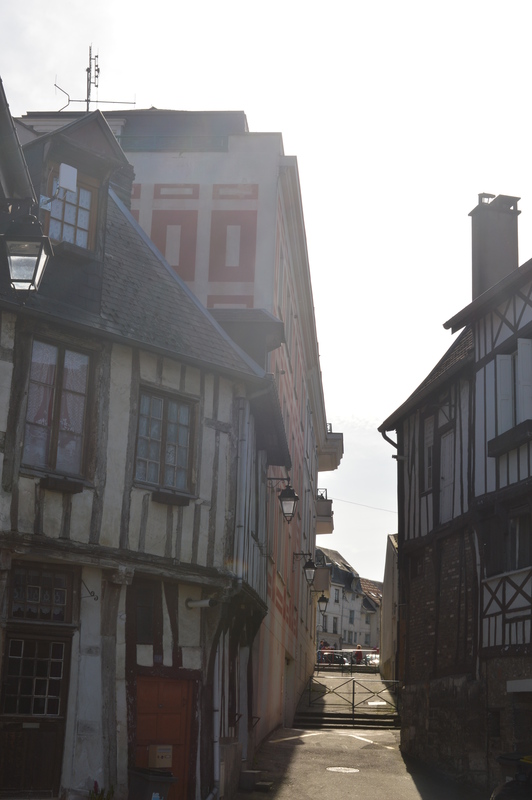 We spent our first day, Saturday 18th, at pretty medieval town of Pont-de-l’Arche, just south east of Rouen. It was a very hot day (25°C outside) and sat on the grass by the river Eure, as well as walking along it to Les Damps and enjoying a beer in the sun outside one of the bars in the town square. 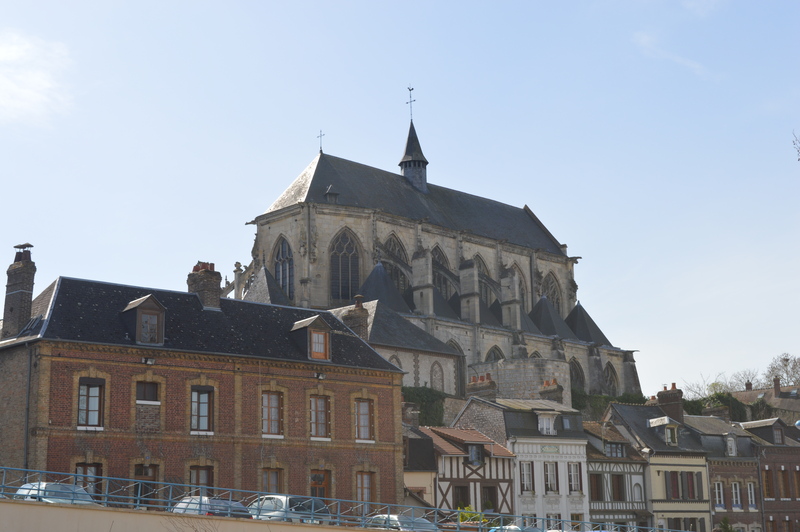 This is another wonderful free motorhome aire with a charming view of the church of Notre-Dame-des-Arts and the river. 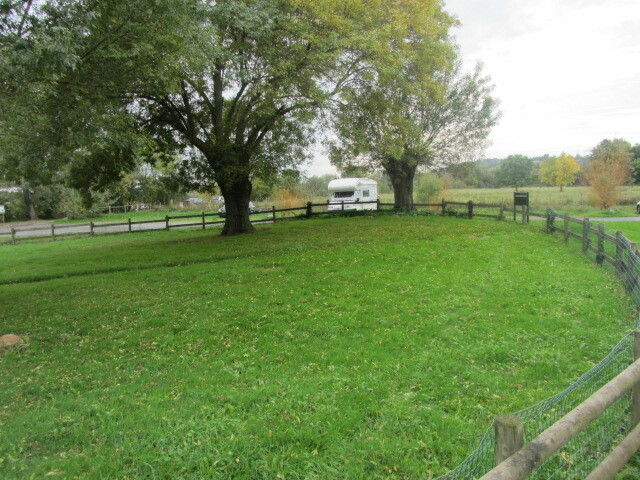 We noticed that the access to the green by the river had been blocked by big boulders, perhaps to stop the New Age travellers from camping on it, like it happened at Easter. I will mention that we were badly delayed leaving England at the Eurotunnel terminal, as we sat inside the train for 45 minutes due to a technical fault and we didn’t arrive in Calais until 9.10 pm, which is a bit too late for our liking, for we still had to heat up our usual pizza and had to content ourselves with some crisps during the crossing, being rather hungry by then. I suppose we travel so frequently that these things must be expected from time to time. 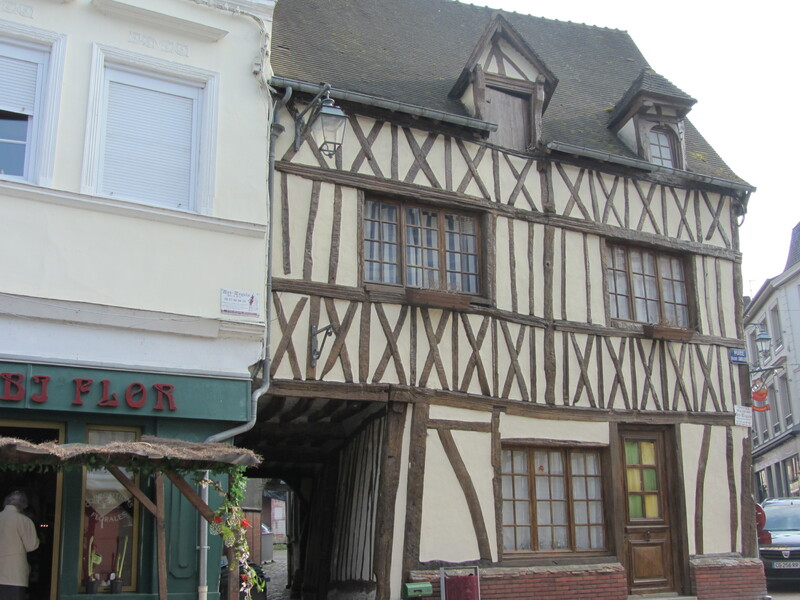 Tomorrow we’re heading for Les Roches l’Évêque near Vendôme and then to Amboise for a couple of days. 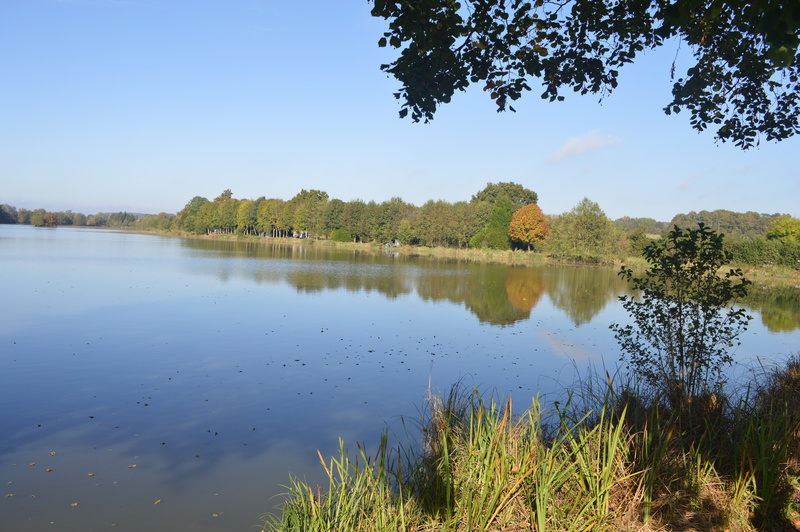 We’ve decided to try out this lake about 6 miles (9km) south of Le Mans to see if Adonis is a bit more successful with his fishing, as he hasn’t been very lucky lately. We have provisionally booked for 2 days, but might push another night if weather holds. It’s very quiet here and the British couple in charge, Bob and Les, are very friendly and welcoming. We have water, electricity, a hot shower, the sun has been shining all day and it felt quite warm in the van without any heating until now, 5.30pm, so it’s been a good day. 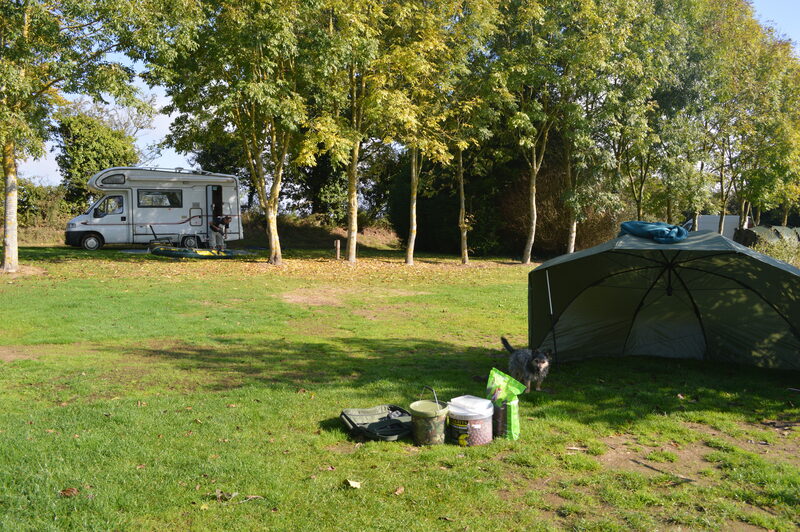 This is, however, the first nice day we’ve had since we left home on Thursday morning, as the weather turned very windy and wet in the evening at Wissant, with the van rocking in the middle of the night, waking us up. 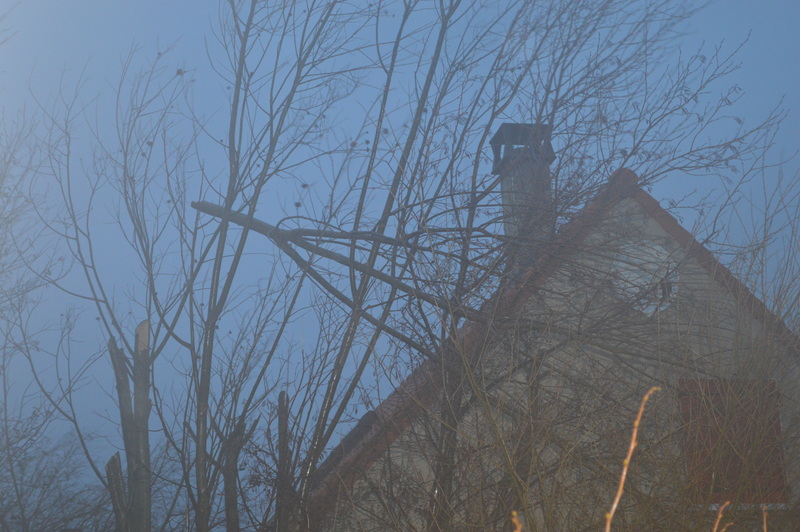 In the morning, we saw a branch from one of the trees behind the van had been broken off and had caught in the branches of the adjacent tree, so lucky it didn’t damage either the motorhome or the house in whose garden it stood. 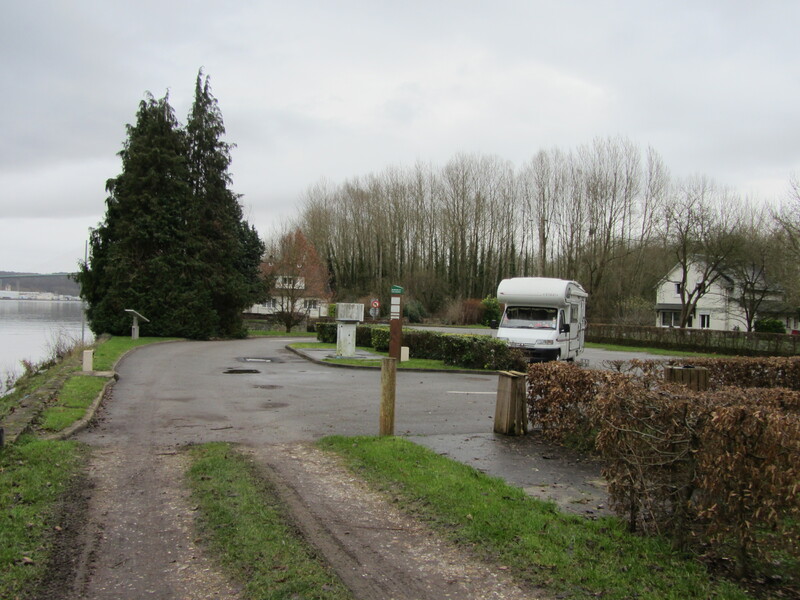 We followed the same route south as in October half-term, stopping at the motorhome aire at Buchy, just north of Rouen, as we had really liked it then. As we arrived by lunchtime, we took Beano for his afternoon walk through the market town, but as we got to the centre, he was spooked by something and, while I was taking pictures of the market place and Christmas decorations, he managed to pull the lead off Adonis’s hand and I saw him running for his life in the middle of the road heading straight for an on-coming car. I screamed and Adonis waved his arms about to stop the traffic and Beano ran to the pavement, heading uphill back to the M.H. Aire. I ran after him, but he was too far in front and I would have never caught him if it hadn’t been for a kind young couple who saw him coming and luckily stopped him and kept him until I got to them, breathless but relieved to have got him back safe. So we took him back to the van and left him there with his food and water and we went out again to enjoy a coffee at one of the local bars and to continue taking photos of this charming little town. 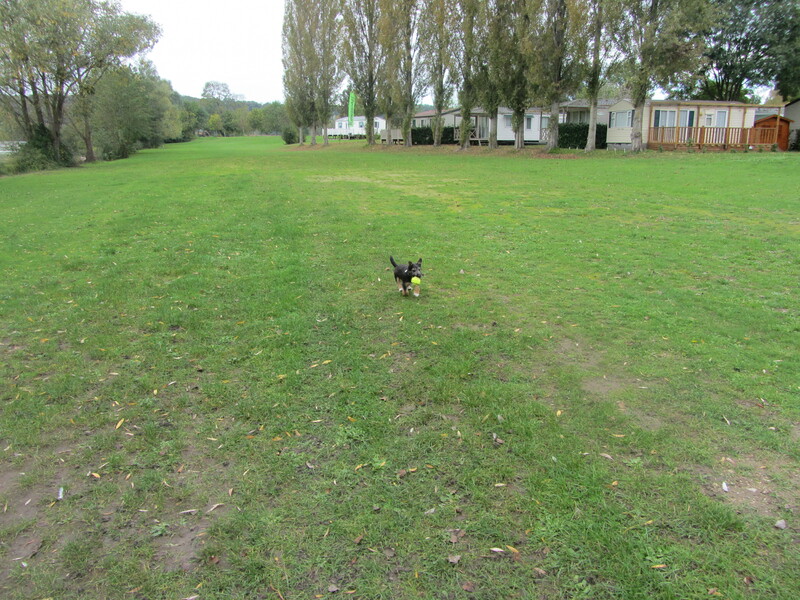 I think that from now on we will remember Buchy as the place where Beano ran off and I nearly had a heart attack! On Saturday morning, we bought our baguette and cake from one of the boulangeries in town and continued on south, still round the north and eastern side of Rouen, as the Pont Mathilde is still closed until the summer of 2014, and followed the usual route down to Alençon on the D438 and from there on the D338 to La Hutte, where we headed west for about 4 miles on the D310 to Fresnay-sur-Sarthe, where we stopped at the motorhome aire by the circus school which John and Julie had told us about, right by the old railway station. This was very pleasant, but the water had been turned off, so we bought 2 5-gallon bottles of water at the nearby Le Mutant supermarket, just to be on the safe side. Once again, we went to explore the town, but this time we kept a firm grip on Beano’s lead and we even carried him in our arms for a bit when we was reluctant to walk and was pulling back too much. 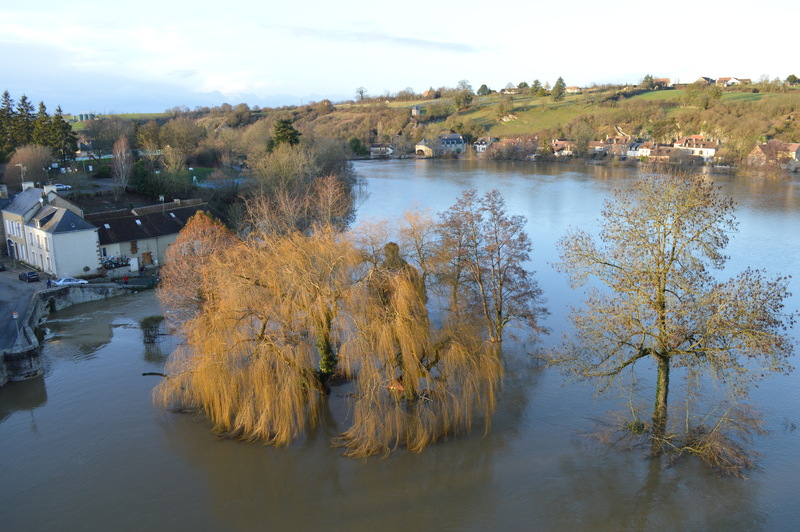 We were amazed to see that the river Sarthe had burst its banks again and quite a few houses seemed to have their gardens and outbuilding under water or badly flooded, so we were worried that Bounty lake, just a few miles down the road, might be the same, but luckily we are all right here. 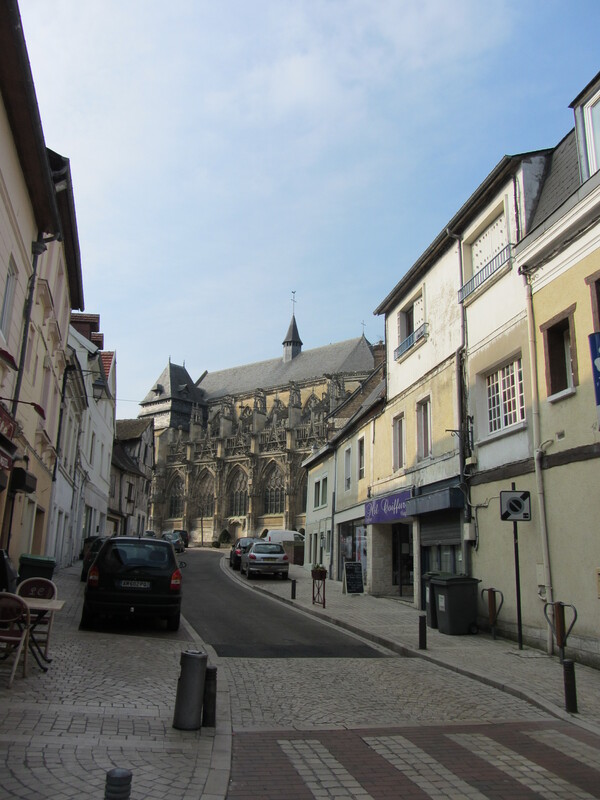 Fresnay-sur-Sarthe is a really charming town and we have fond memories of our first summer holiday in the van back in 2010 when we watched the Football Worldcup final between Spain and Holland and how friendly the campsite manager had been, giving out free beers to everyone. We hadn’t come back since, so I am glad we have now, and we should return again in the summer and enjoy a swim in the river, like we did with Pepo and Bramble 3 years ago. Today’s been a short drive from Fresnay-sur-Sarthe, back on the D338 and round Le Mans, past the 24-hour racing circuit and back on the D338 to Lake Bounty. 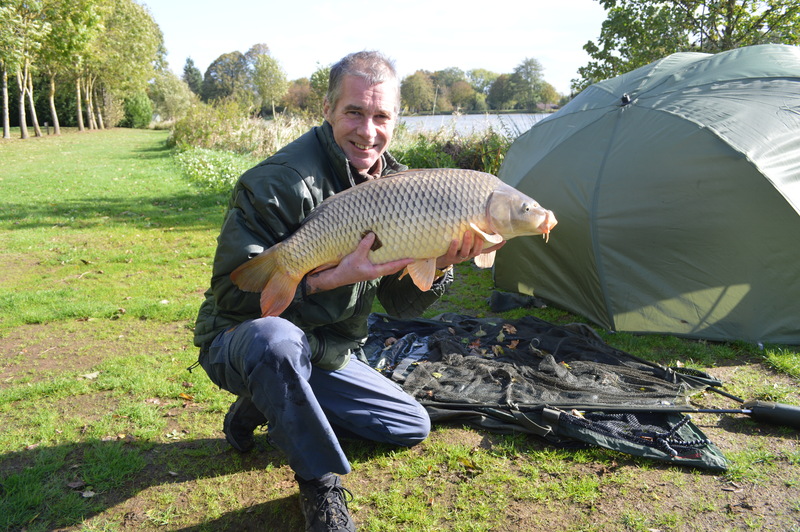 We arrived by 11am, with plenty of time for mid-morning coffee and cake, showers and even fishing before lunch! 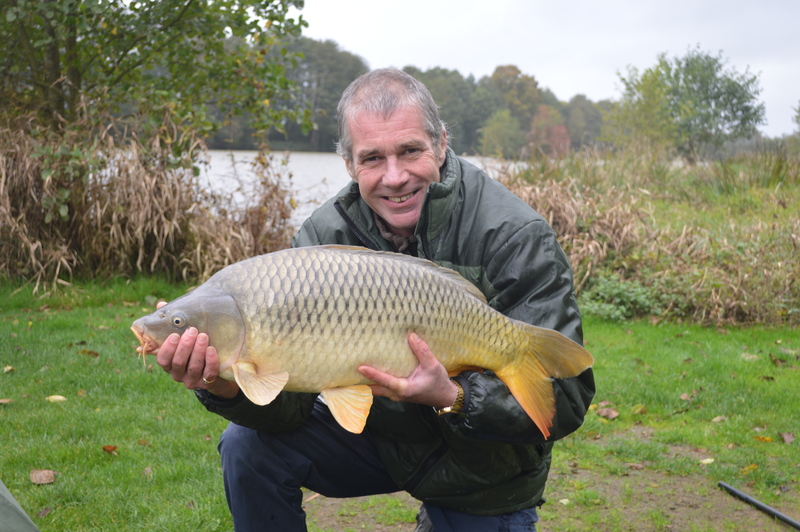 We hope the weather holds so that we can keep on enjoying the walks around the lake, the fishing and, most importantly, relaxing in the sun. 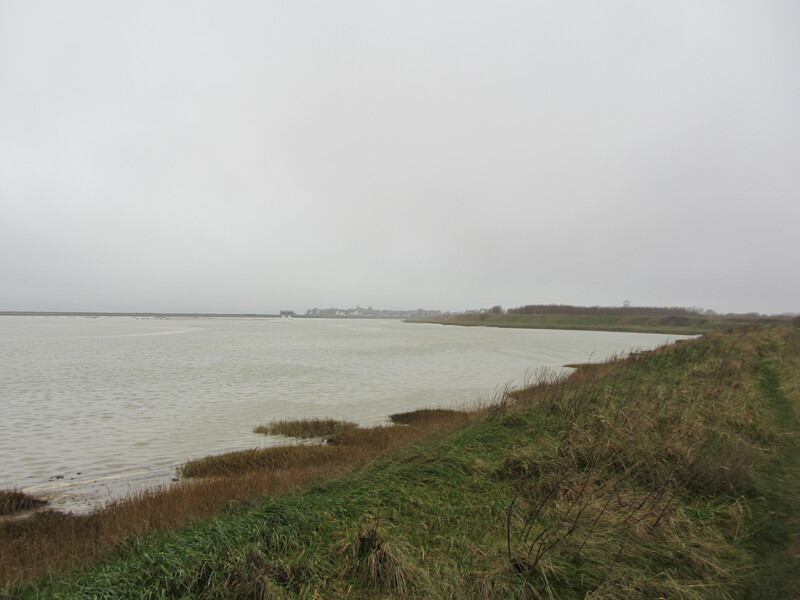 We started our half-term holiday last Saturday morning, 19th October, and, after an uneventful crossing in the Eurotunnel, where we enjoyed a quick sandwich, we made our way to Boulogne-sur-Mer (junction 31 on A160 for our usual shopping at Auchan. 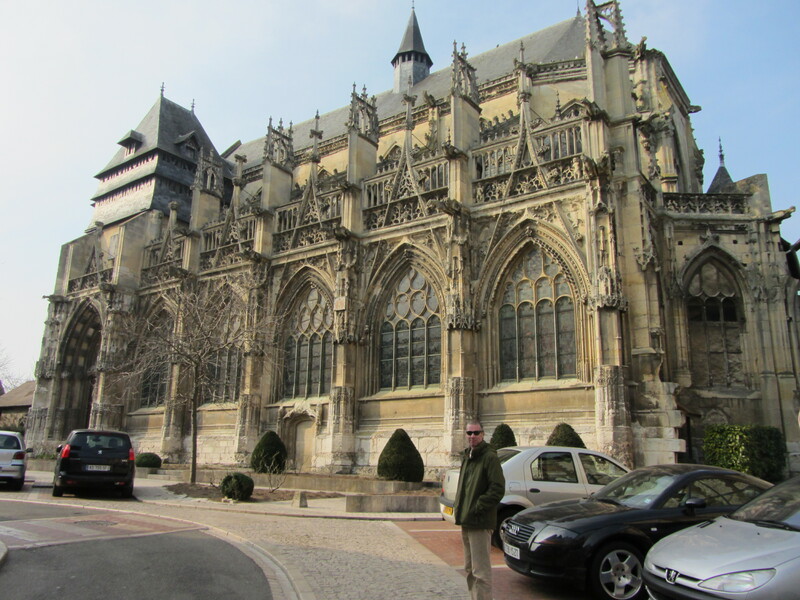 As it had already been a long drive from home in Bognor Regis, we decided to stay on the motorway and followed the A28 south of Abbeville to junction 9 and on to the motorhome aire at Buchy on the D928 and D41, about 15 miles north east of Rouen. 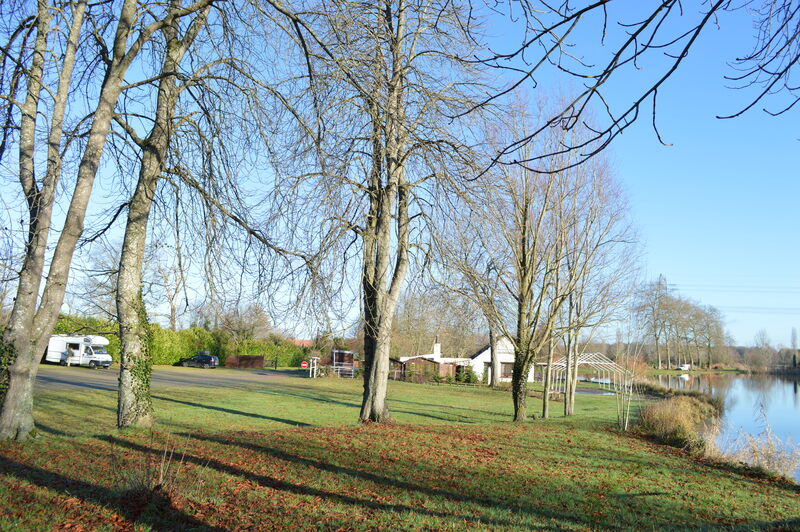 Buchy’s is a very pleasant aire by the car park at the sports centre (Parking Salle des Sports), Route des Fourges, and near the college. The book says it has 4 pitches but we reckon that there’s room for double that number. It is free, with a borne for water and electricity for €2.50. The pitches are on hard standing and there is no clear division between them but they are surrounded by well maintained grass and it’s perfectly adequate for an overnight stay. As it was already late afternoon, we didn’t do very much other than walk Beano, our new puppy, and eat our flammekueche (or Tarte Flambée), which is a lovely alternative to pizza. As we have our new puppy with us, we had to get up early for toilets, etc and were ready to leave Buchy before 9 am on our way to the aire at Montbizot, still travelling on the eastern bank of the River Seine at Rouen, as Pont Mathilde on the western side is still shut for repairs until the summer of 2014! So we followed the D6015 to Junction 21 of A13 west to J. 24 by Château de Robert Le Diable and then the usual route past Bernay, Broglie, Sées, Alençon and Beaumont-sur-Sarthe. Montbizot is half way between Beaumont-sur-Sarthe and Le Mans and we made it there by 12.30 pm, as the roads were empty, being a Sunday morning. 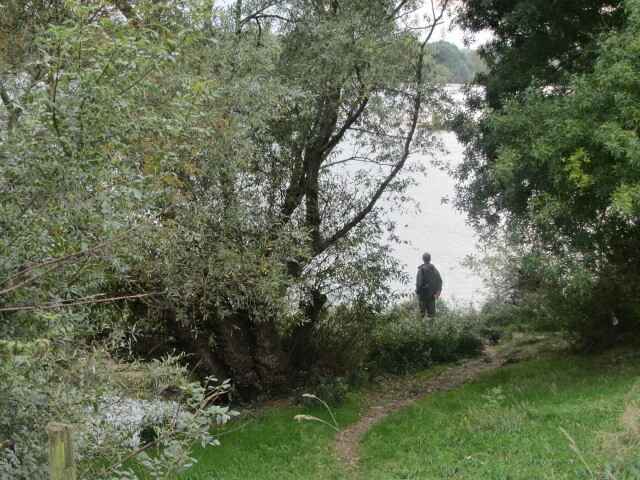 We had a heavy downpour for a bit, but it was still warm and pleasant for walking by the river Sarthe. This was another quiet afternoon, followed by a delicious Parmentier de Canard bought at Auchan, which only required heating up in the oven. 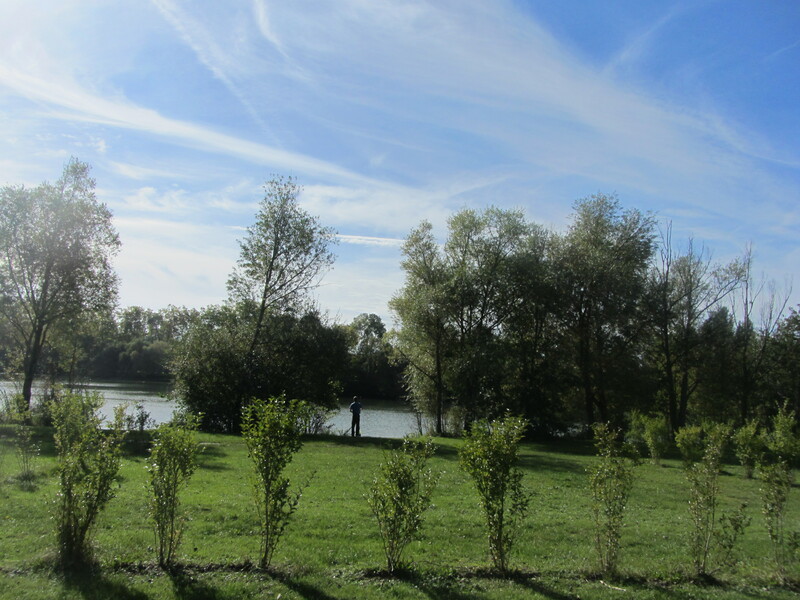 From Montbizot, we carried on south to our main destination of this break at tried and tested and very much loved Lac des Varennes, near Château-du-Loir on the D338 and D305. As this is our seventh visit to this wonderful campsite and Base de Loisirs, there is nothing much new to say except that this time John and Julie, whom we met in the summer holidays at the aire in Bourget-du-Lac, came to meet us there and we spent 3 wonderful days with them and their daughter, Hannah, and her boyfriend, Adrian. So we shared some lovely food, including a most delicious Confit de Canard with Saute Potatoes courtesy of our friends, and, of course, plenty of cheese and wine! 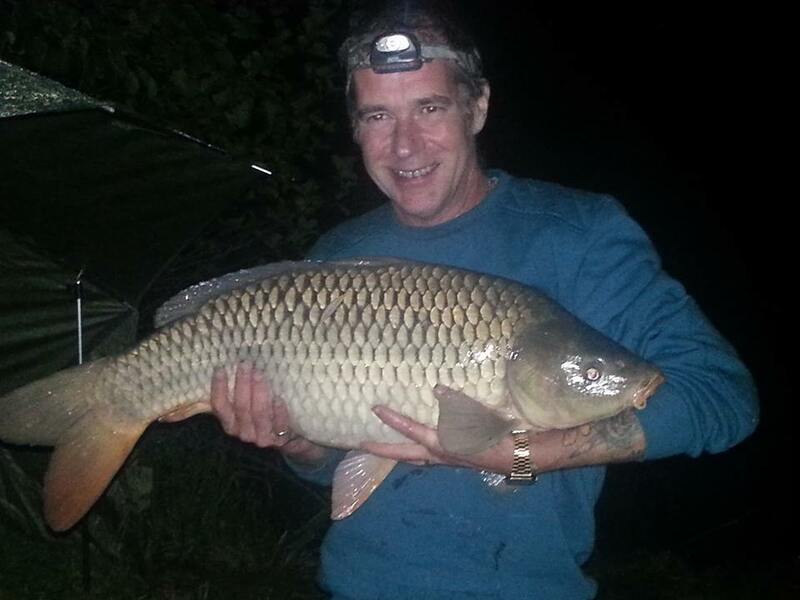 On Tuesday night, at around 11 pm, Adonis finally caught a 19lb carp (roughly 9 Kg), which made it even more special for him, as he hadn’t caught anything at Easter or in the summer holidays. Unfortunately the flash on my camera went on strike and I had to rely on John to take pictures with his mobile phone. Thank you John! Wednesday was quite a warm day and we spent it outdoors most of the time, just enjoying the sun and the peace of the place this time of year, when Beano can run freely as there’s no-one around. 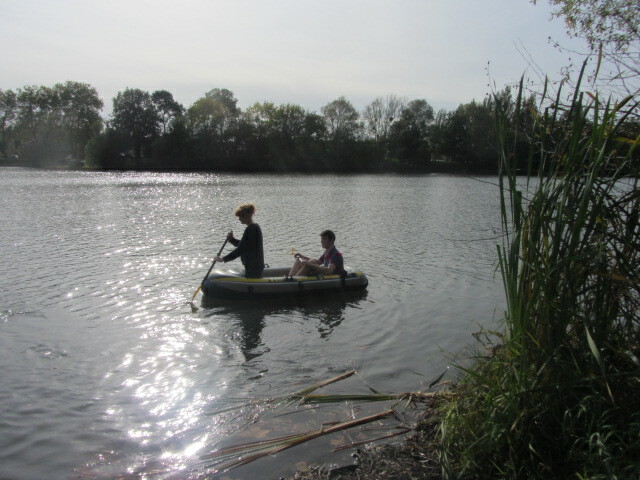 Yesterday started overcast but it cleared after lunch and Adrian, Hannah and Julie enjoyed a paddle in our inflatable boat around the lake, of which we are very pleased, as we hadn’t used it yet on this holiday. That was followed by some refreshing beers and snacks by John and Julie’s pitch, where we decided to move from our usual fishing area when Adonis decided he didn’t want to fish any more. So we packed the van and up we drove to the drier area near the only open shower block closer to the reception area. We left this morning after saying our goodbyes and hoping to meet up at Easter again and we were on the road again for 9.30 am. We did a quick shop at Leclerc in Château-du-Loir and headed slightly south west on D766 past north of Angers on A11 to J. 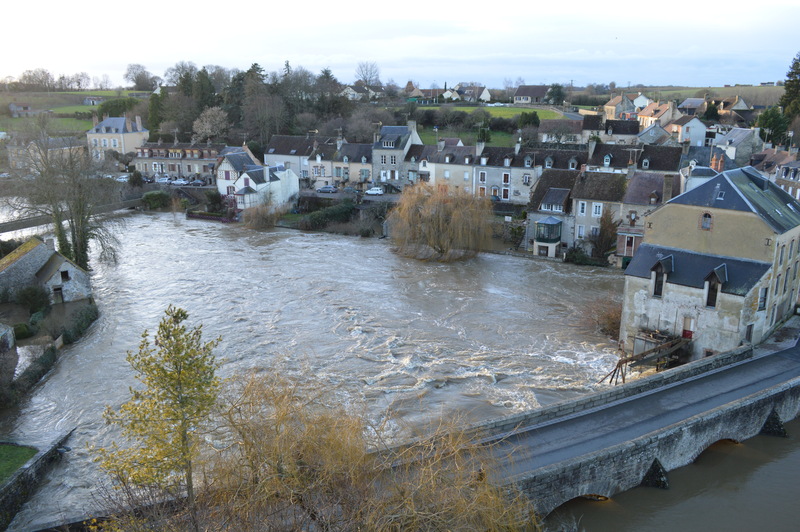 20 with the intention of stopping at the aire at Le Celier, which is supposed to be behind the church and have room for 5 motorhomes but it is non existent. 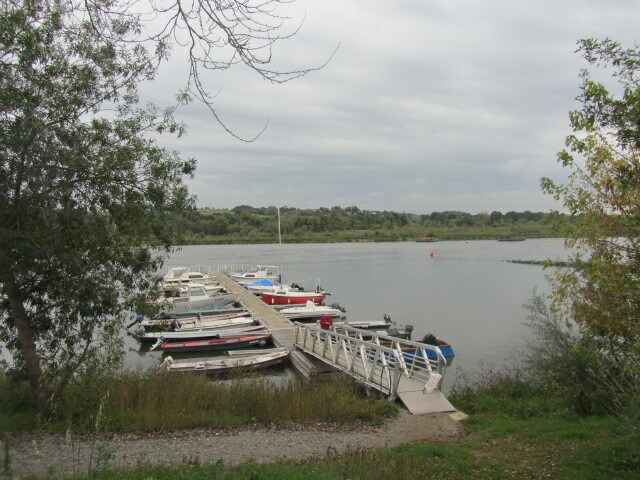 We were annoyed at this, as it was already 1 pm and we hadn’t stopped at all since leaving Leclerc, so we turned back on our heels on D723 to Oudon and here we are, right by the river Loire and just outside the 2* campsite of La Tour, which is now shut until June 14. 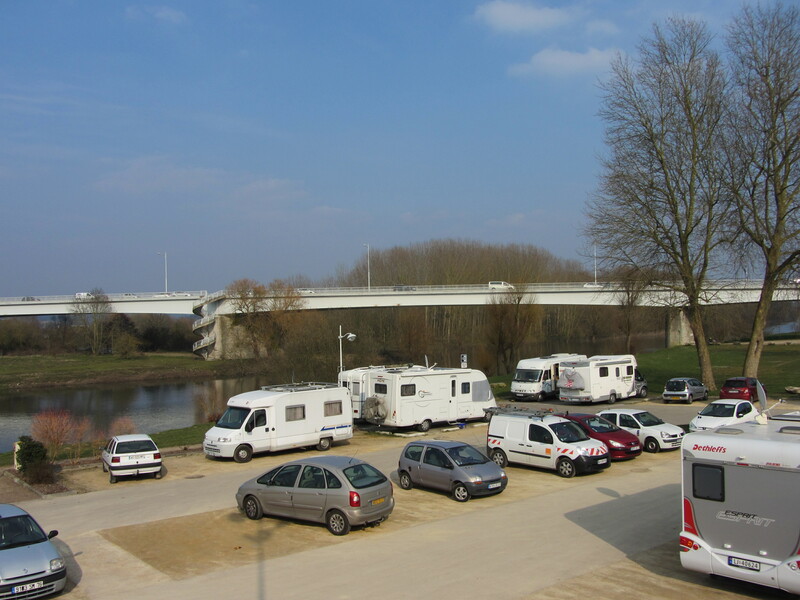 There is a well-maintained motorhome aire at the entrance of the campsite with running water and emptying facilities and it’s free but we are in the general car park, closer to the river, only a few metres from the aire itself. I enjoyed a walk with Beano around the campsite and down to the river bank, which seems to be very popular with the locals. Tomorrow, we’re heading for Carnac on our first ever visit to Brittany. I am really looking forward to discovering a new region in this beautiful and amazing country. 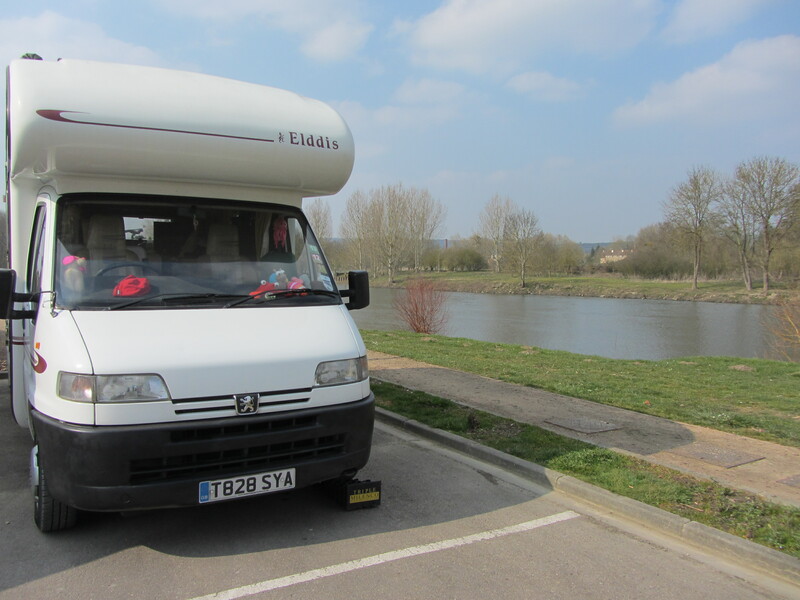 We’re on the banks of the river Eure, just south of Rouen, after driving on the first sunny day (did I say sunny???) we’ve seen for a long time. We saw this very pleasant motorhome aire when we crossed the bridge north of the town on our way to what we thought would be our final destination for the day at Le Vaudreuil (lat 49° 15’ 29” N Long 1° 12’ 30” E), but we didn’t find the aire there all that attractive or welcoming – although it might have been alright in an emergency- and turned back to Pont-de-L’Arche hoping to find a space, as it was already 2 pm. 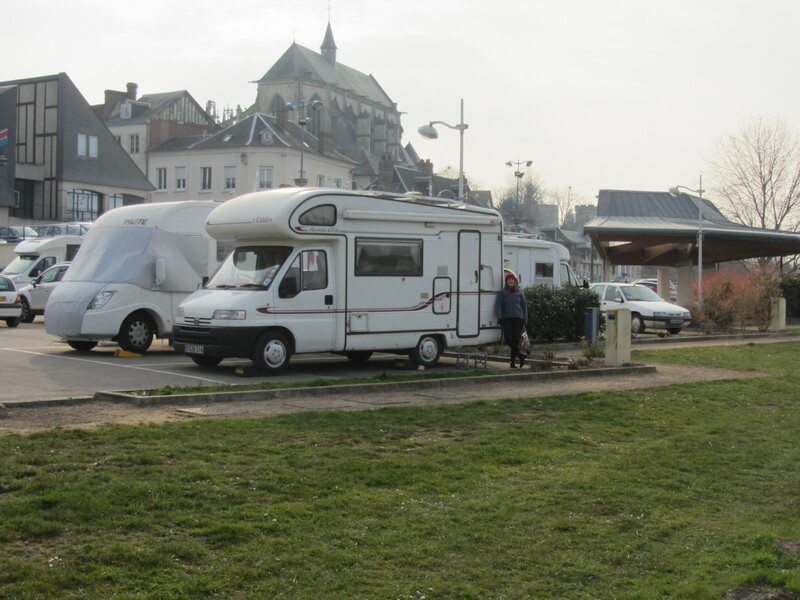 We were lucky another motorhome left soon after we arrived and we were quick to move and take over this prime spot with a wonderful view of the river and the church of Nôtre Dame des Arts on the hill. The aire doesn’t appear on the Guide Officiel aires de Services Camping Cars, but it does exist and it’s free! We’ve just come back from a walk around the small town in the sun (yes, in the sun!) 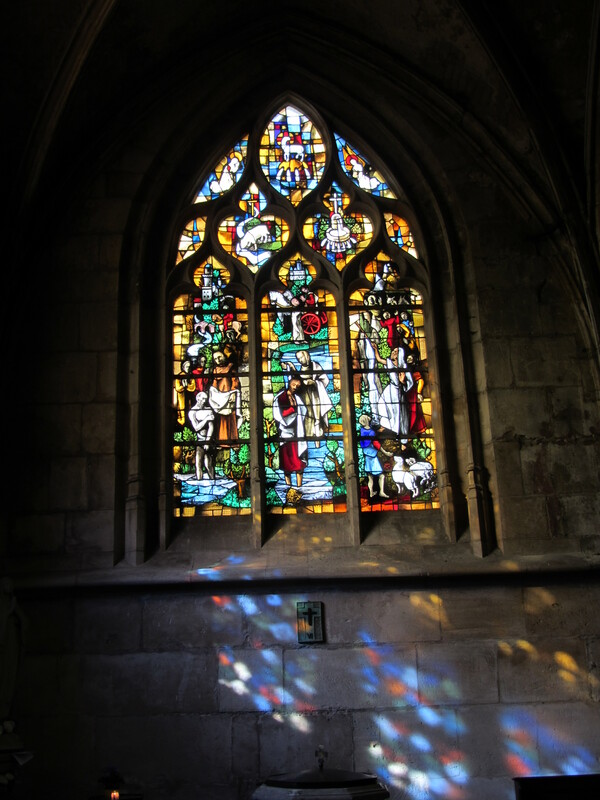 – if still only 4°C – and had a look inside the impressive Gothic church I’ve just mentioned. 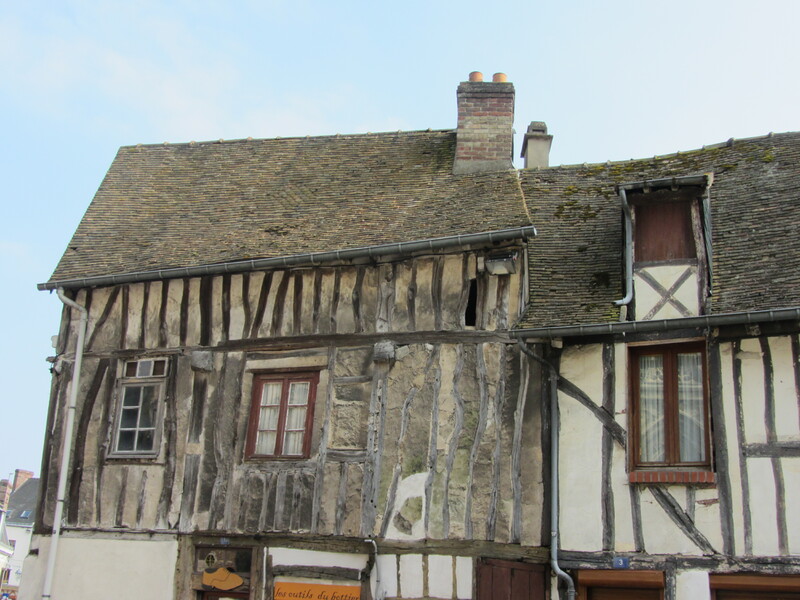 We also enjoyed the half-timbered houses, so old and rickety and typical of this area, and took a few pictures of all these quaint sights. For the first time ever, we were delayed by a whole hour at the Eurotunnel terminal, as there seemed to be a technical fault of some sort in the tunnel itself, so we didn’t leave England till about 7.45 pm and arrived in Calais at 9.20 pm local time, being one hour ahead of GMT. 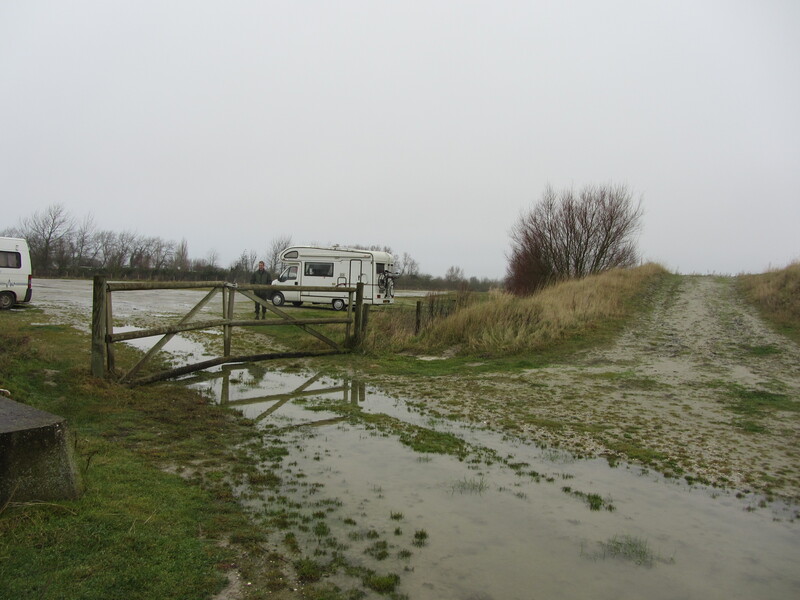 We drove down to the aire at Wissant and luckily there were still a few spaces left, so we quickly parked and heated up our pizza in the oven for a very late supper. We were woken up this morning by one of the buses that usually park there for the night, blaring out some horrendous ‘circus-type’ music at the tender hour of 6.30 am. I couldn’t go back to sleep after that, but stayed in the warmth under the bed covers until 8 am and still the temperature was only 5°C. I let Adonis do his usual chores ‘downstairs’ first and put the heating on, so when I finally ventured down to the living quarters it was already a balmy 10°C. 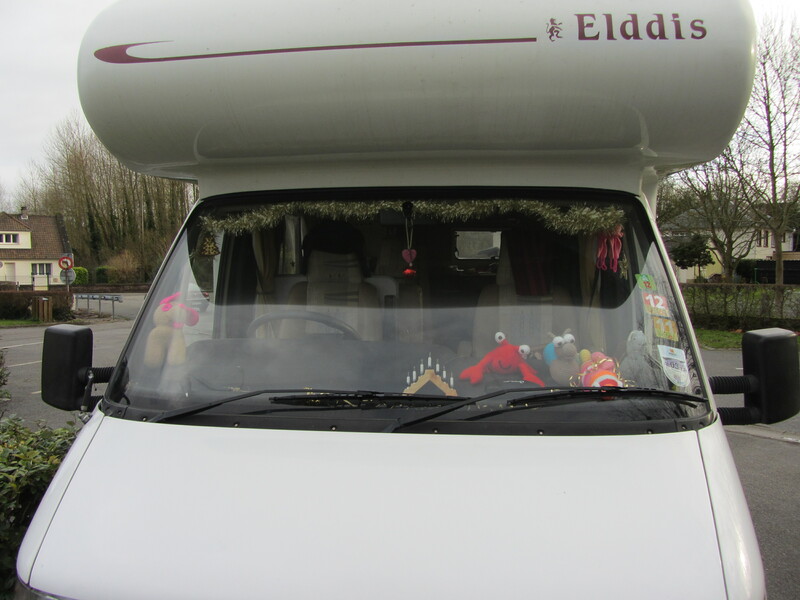 Thank God our Elddis Autostratus has such an effective and fast gas heater! I couldn’t do this otherwise in the winter (I know it’s spring, but the temperatures haven’t caught up yet with the dates). 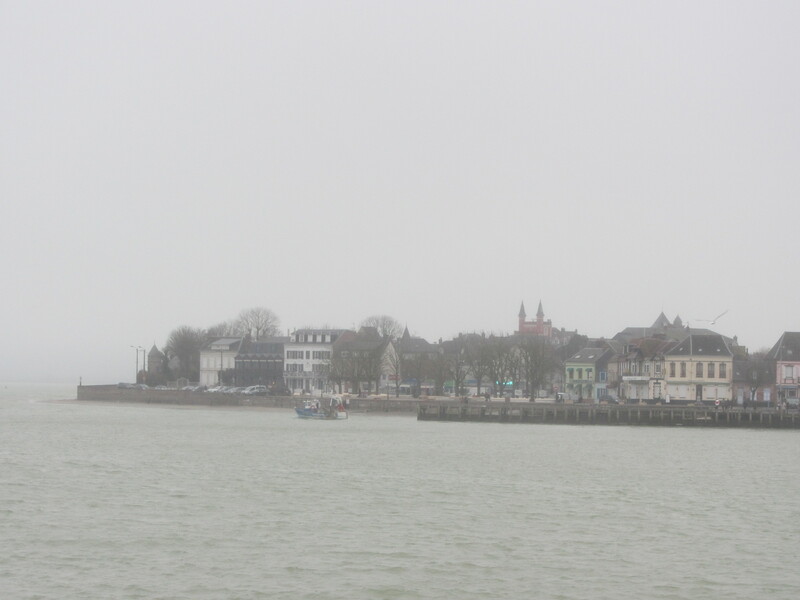 We left Wissant just before 9 am and headed for Auchan at Boulogne-sur-Mer as usual for our big shop to see us through the Easter weekend. 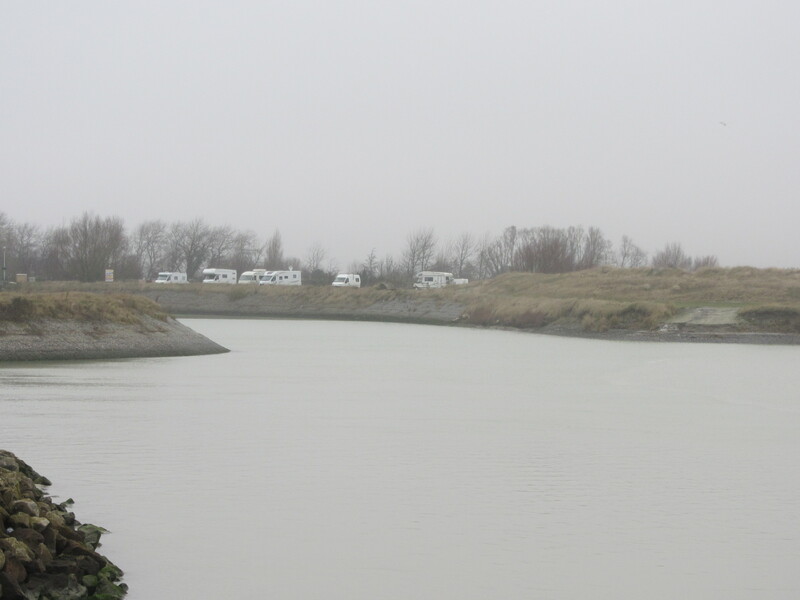 We were on the road again by 10.45 am and followed the A16 to Abbeville and A28 to northeast of Rouen, where we found that the Matilda bridge is still shut (3 months now! ), so we took the D6015 south, which runs alongside the river Seine, and very beautiful it was too and a nice and welcome change to our usual route. 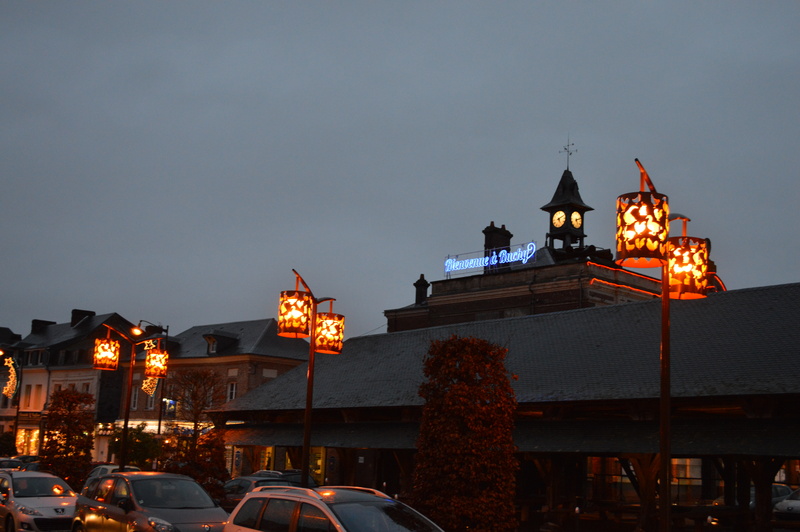 Tomorrow we’ll be heading for Marbué in the Eure et Loir department; it should take just under 3 hours. 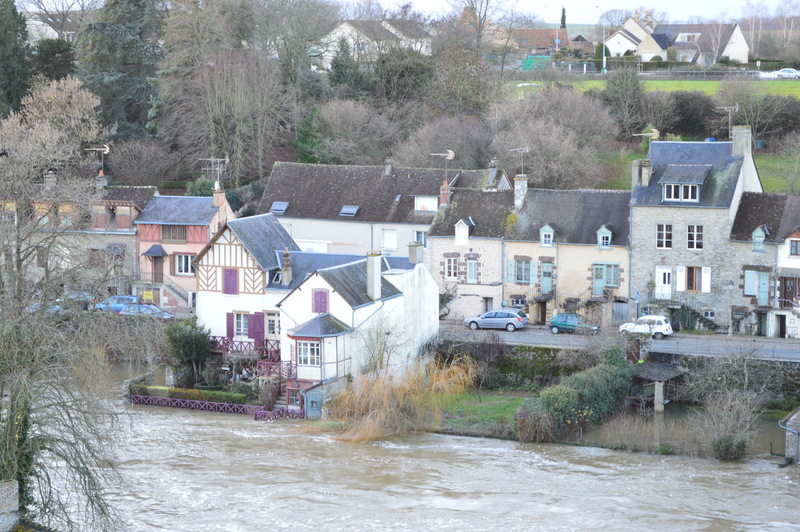 Le Crotoy as seen from motorhome aire. 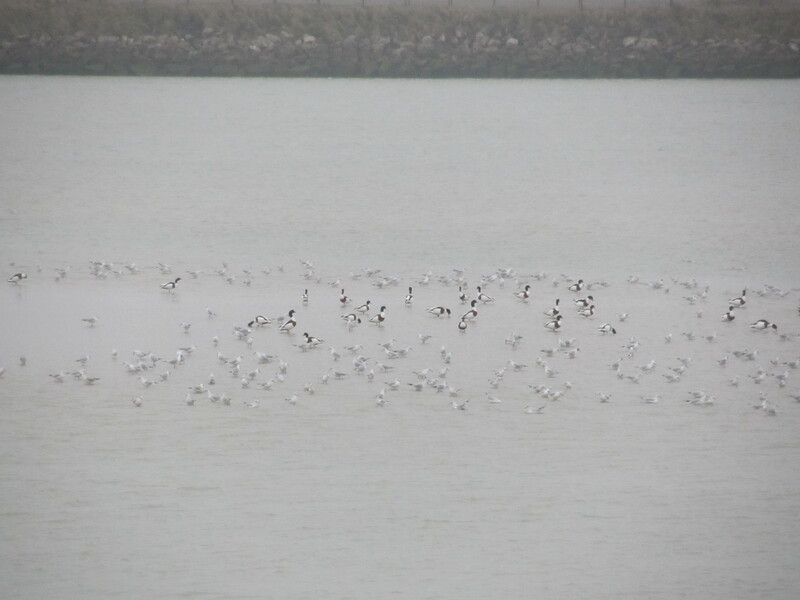 My first entry of the year happens to be on the Bay of the Somme on a misty, but warmish afternoon. The thermometer in the van reads 17 °C and, as we haven’t had the heating on since 1.30 pm and it’s 4.45 pm now, the temperature inside can’t be very different from the outside. 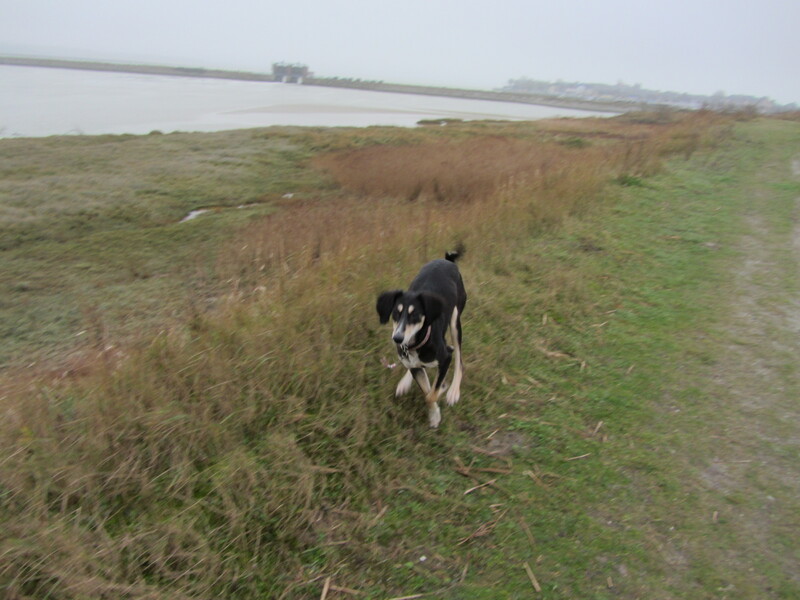 We’ve just come back from a long walk with Sasha around the bay and the marshes and Sasha had a whale of a time leaping about, chasing the seagulls and the ducks. 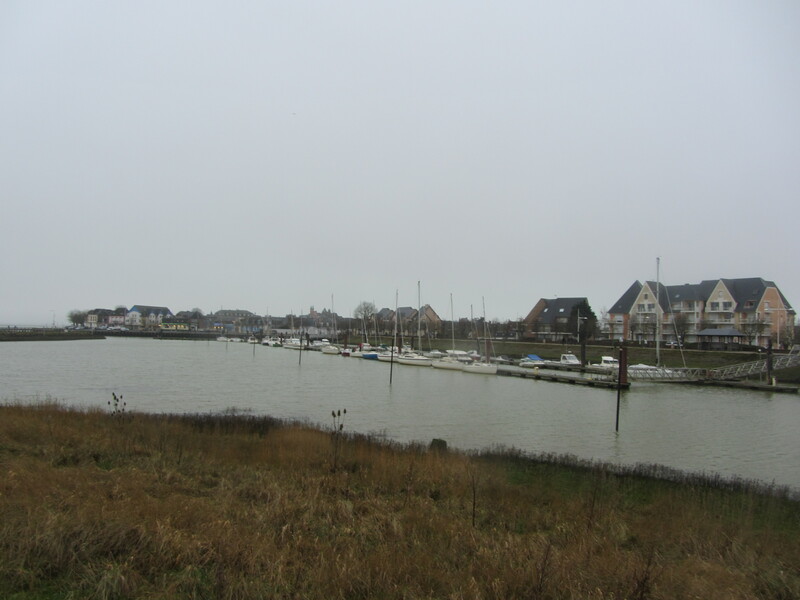 I took lots of pictures all the way as I never tire of the beautiful sight of the town of Le Crotoy from the motorhome aire and the marshes. The aire still costs €5, plus €2 for the water and electricity borne if needed. There are 8 vans here at the moment and it’s hard to imagine now how busy it was in the summer, with hardly any spaces left, even though the parking area is quite big, with room for 200 vehicles! 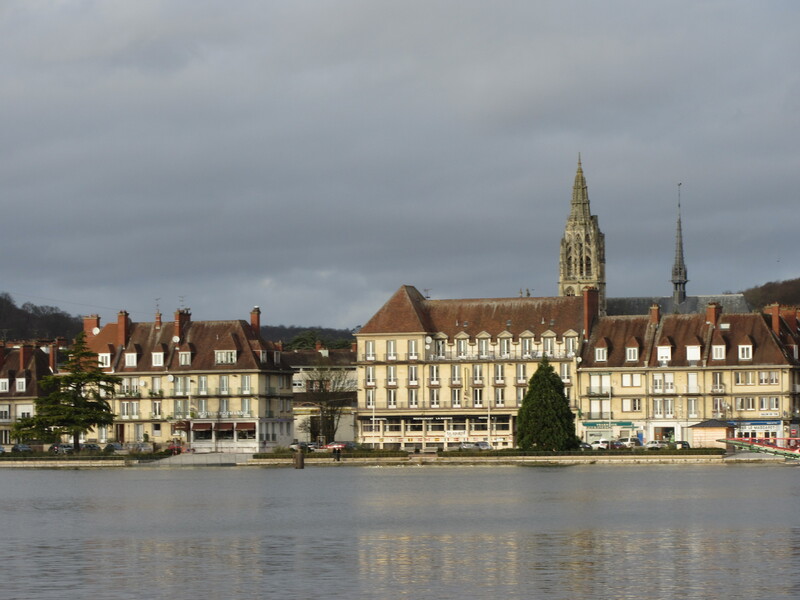 We thoroughly enjoyed our break at Amboise, as always, and left on 1st January for Montbizot, north of Le Mans, following mainly the D938/338 from the north of Tours. 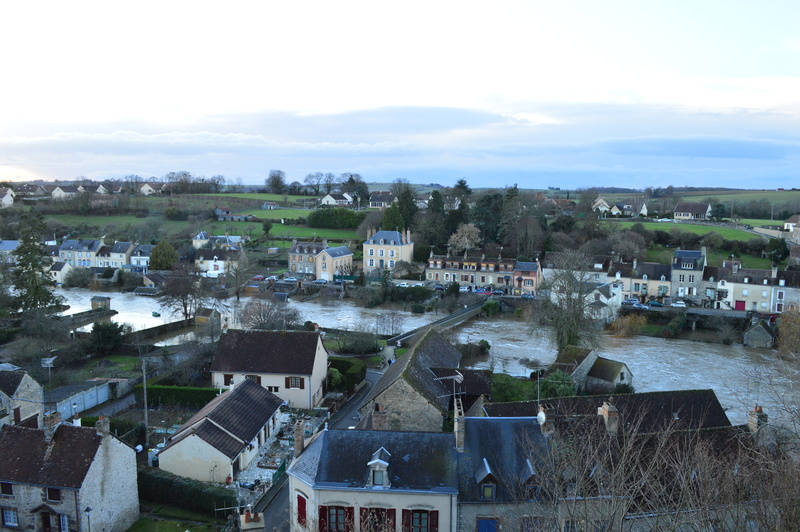 Montbizot has a little aire with enough room for 6 motorhomes, but the water and electricity supply borne was switched off for the winter, but as we had topped up in Amboise, it didn’t really matter. 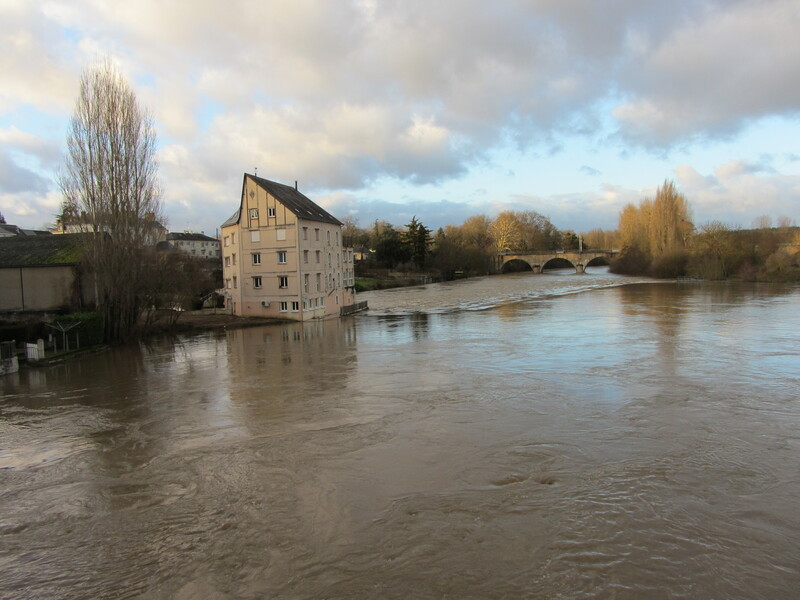 Again, the river Sarthe was overflowing and the walking area and path were waterlogged and flooded in parts, so walking was difficult and Wellington boots were a must! After Montbizot, we carried on north on the D338 past Alenҫon and D438 to Broglie, where once again we had made an appointment with the vet to have Sasha wormed and checked before returning to England. The guard came early in the evening to collect the €5 fee and we also bought a jeton (token) for water for €2.50 to last us until the end of the journey. We were glad to see that everything was in working order. It felt very strange this time round not to have Bramble with us, as we’ve been here so many times with him, especially during the walk along the Charentonne river. Even the vet asked about him. 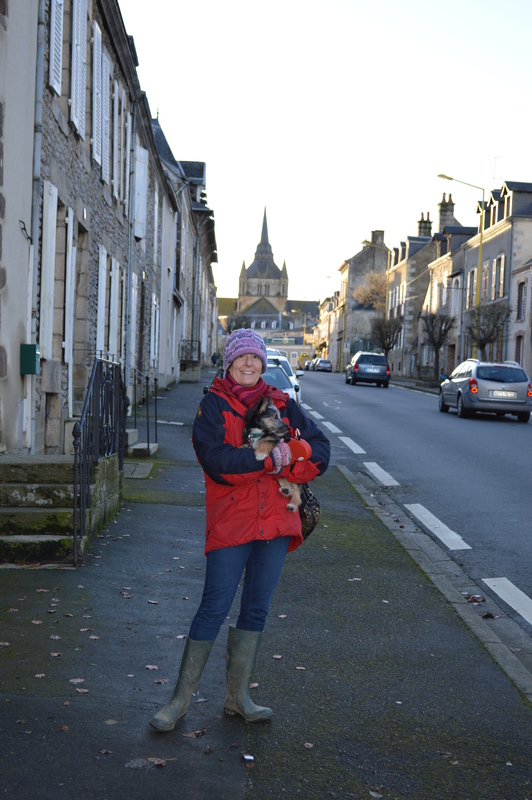 Still, Sasha loved the walk too and I hope it will be the first of many happy walks in this lovely village. 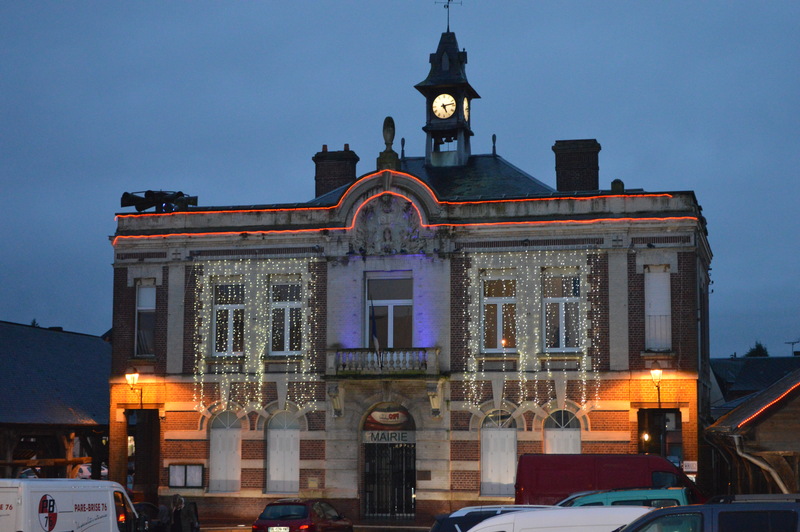 The vet was booked for 8.30 am, so we made an early start this morning and got here for 12.30 pm, following the A28, joining it at junction 14 north of Bernay and on past Rouen, but we had to take the A150 for a little while as the bridge was still closed on the Eastern side of the city and the traffic was diverted westwards. 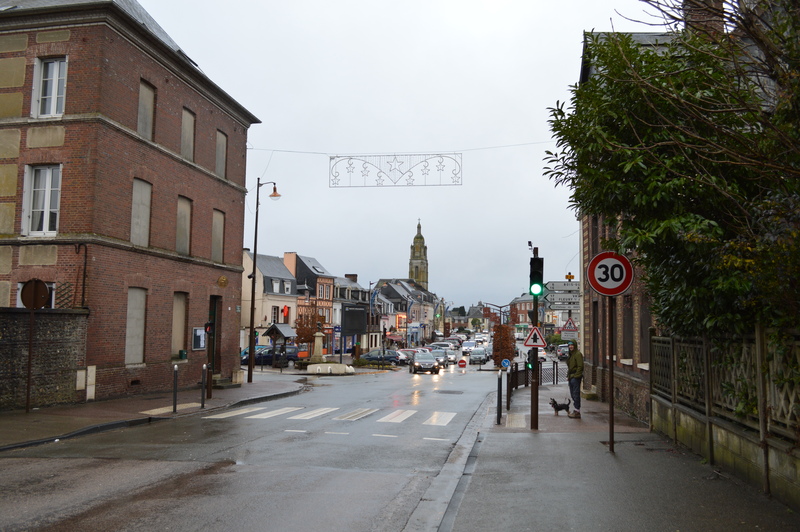 We joined the A28 again at J.11 and followed the usual route past Abbeville to J.1 and D40 to Le Crotoy without any further disturbances to the traffic. 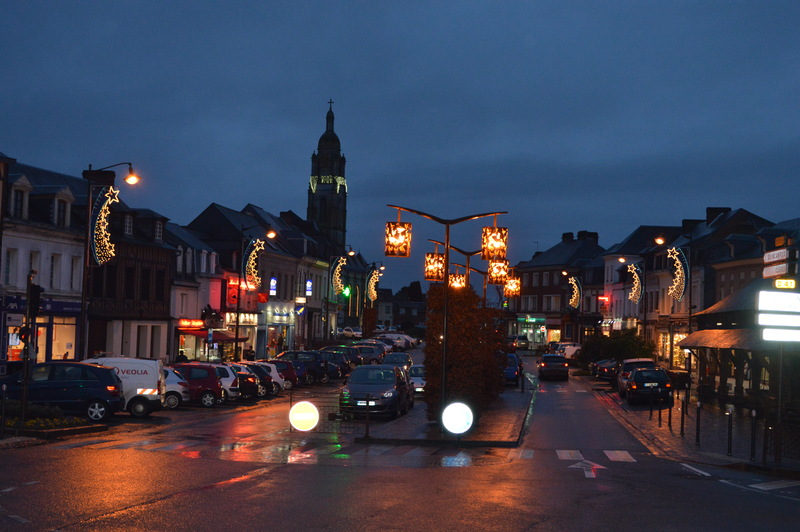 We are off to Auchan at Boulogne-sur-Mer for our final big shop to stock up on wine and beer before our final overnight stop at Wissant and going home. 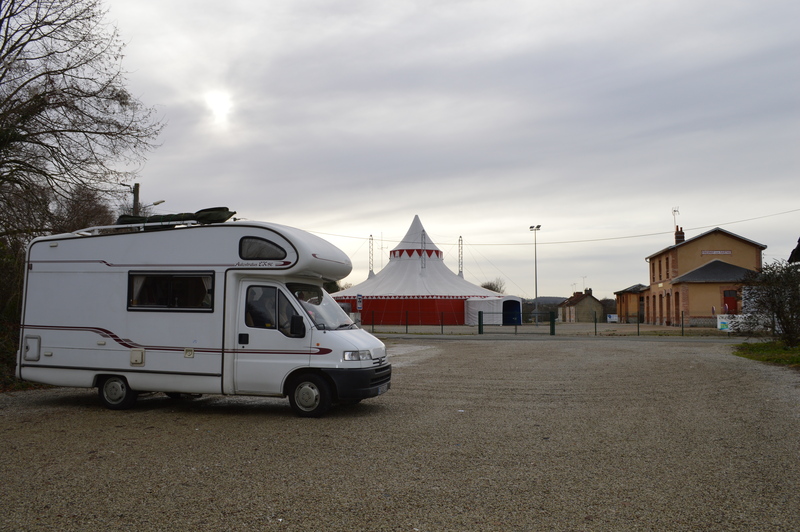 This is going to be our first Christmas travelling in the motorhome and we hope to make it as far as Arles, Provence, as our final destination before turning back, but, as always, nothing is written in stone and we’re willing to change our plans on the go if necessary. 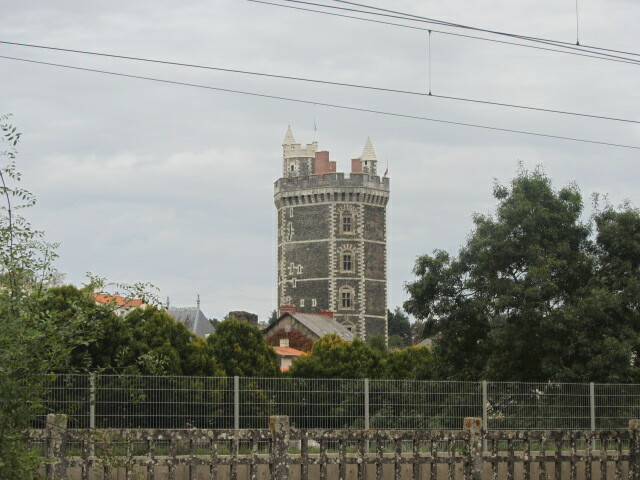 We left England last Saturday 15th on the Channel Tunnel as usual and were in Calais just before 3 pm. 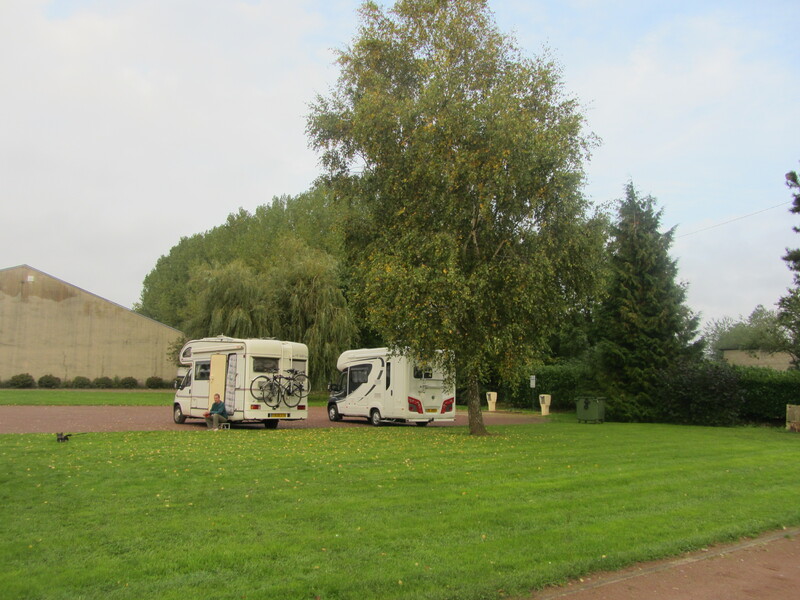 We did our shopping at Cité Europe and were at Wissant aire for 4.30 pm with only one other motorhome to keep us company: a far cry from last August when we were lucky to get a space. It must have been raining quite heavily here too, as the field opposite the aire where we usually go for our dog walk was waterlogged and difficult to walk on. Still, it was a dry and pleasant evening and the feeling of freedom at being away is always comforting, whatever the weather. We had another downpour overnight, which kept me awake for a bit, but Adonis managed a long dry walk on the beach with Sasha, our new four-legged travelling companion, before the rains started again. As usual, we followed the A16 and A28 south to Rouen and we were making good time until we came across the signs north of the city indicating that the bridge over the Seine was shut and we had to find an alternative route. We followed some signs to Le Mans, which eventually disappeared in true French fashion and ended up on the A150 and A151 heading north again!!! 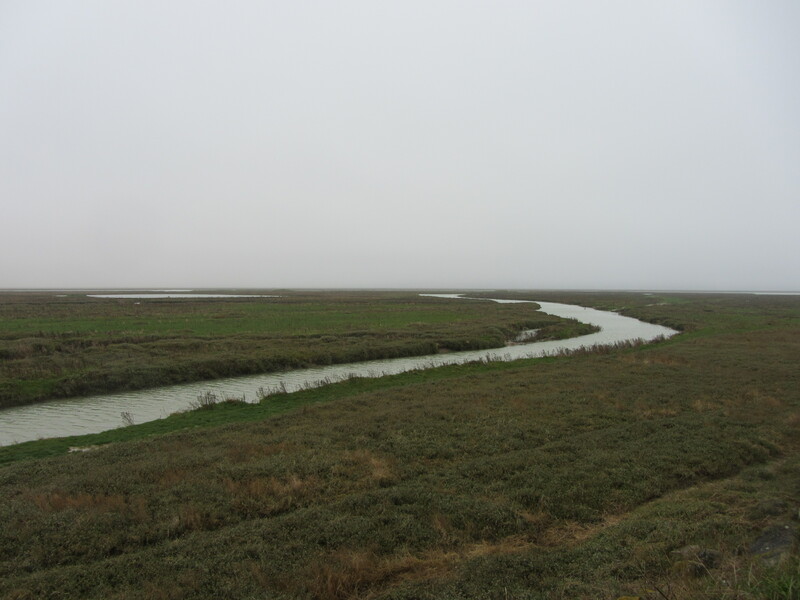 We got off at Tôtes and headed west towards Yvetot on D929 and then south on D131 to Pont de Brotonne and finally made the decision to stop at St Nicolas de Bliquetuit for the rest of the day, as it was already 2 pm. 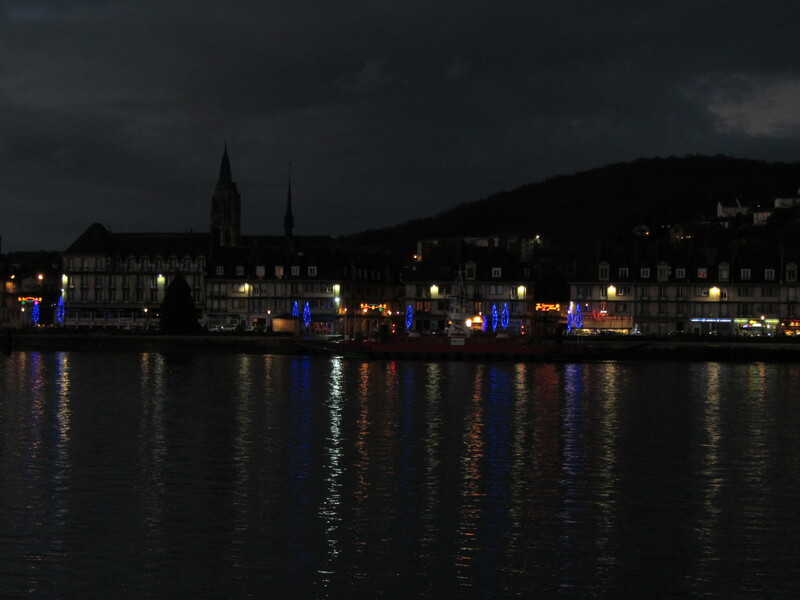 Although our original intention was to stop at Broglie aire for the night, we quite welcomed the sudden change of plans, as the view from the free aire is just stunning, right on the river Seine, especially with all the Christmas lights and decorations. 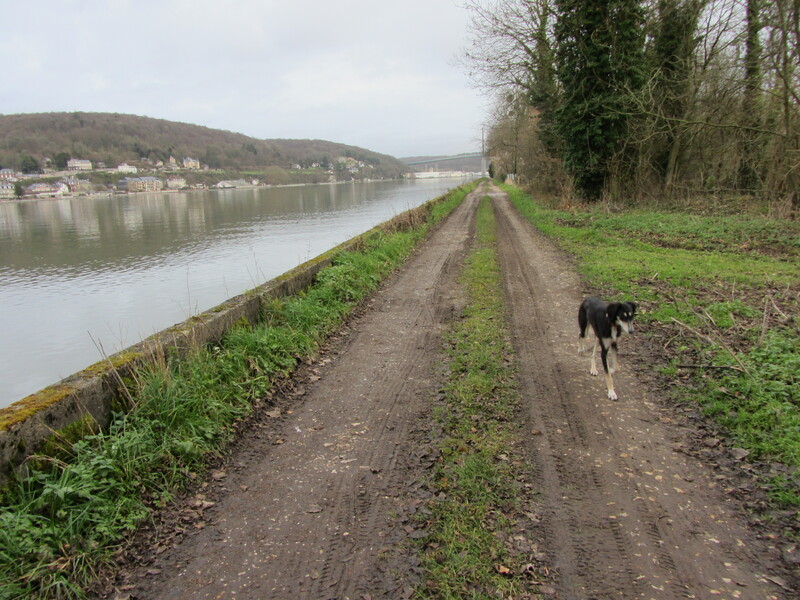 Sasha and I enjoyed a long walk along the river bank and I never tire of admiring such beautiful view. 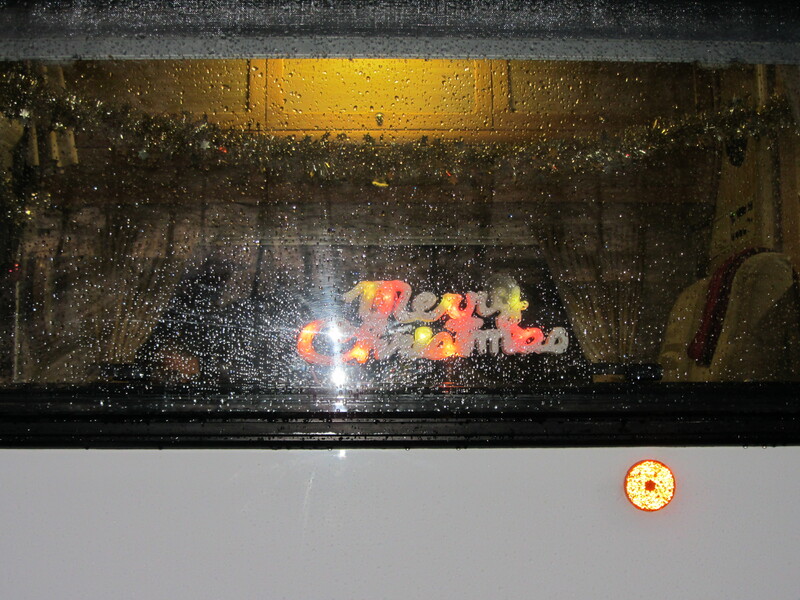 I took a lot of photos, of course, both of the town and our festive decorated motorhome, full of tinsel and baubles. 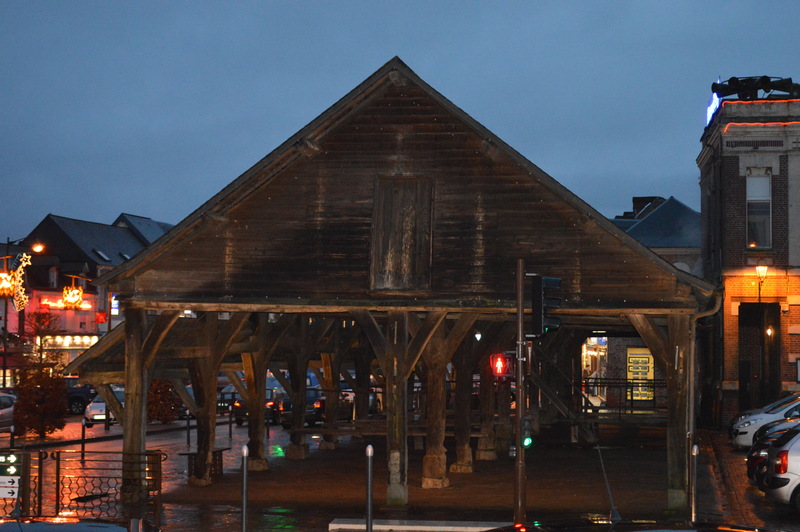 The view of St Nicolas de Bliquetuit at night. We were on our way by 9.30 this morning still headed south on D913/313 to junction 25 of A13 and south on A28, all the way to north of Le Mans, where we joined the A11 southwest to J9 for la Suthe-sur-Sarthe. 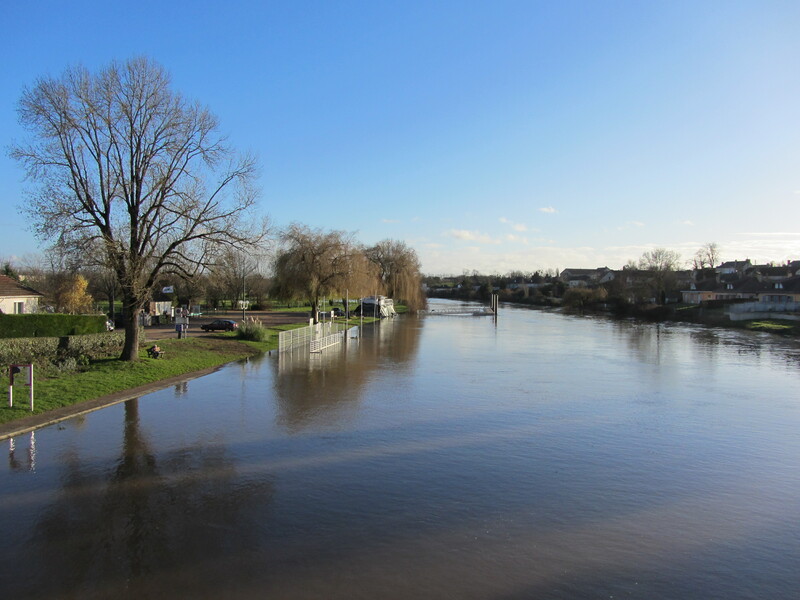 We love this wonderful aire and we’ve been here in all kinds of weather, but this is the first time that we have found it flooded in some parts, as the river is all the way up to the landing bays and the swim where Adonis was fishing last summer is completely under water, so no fishing today! 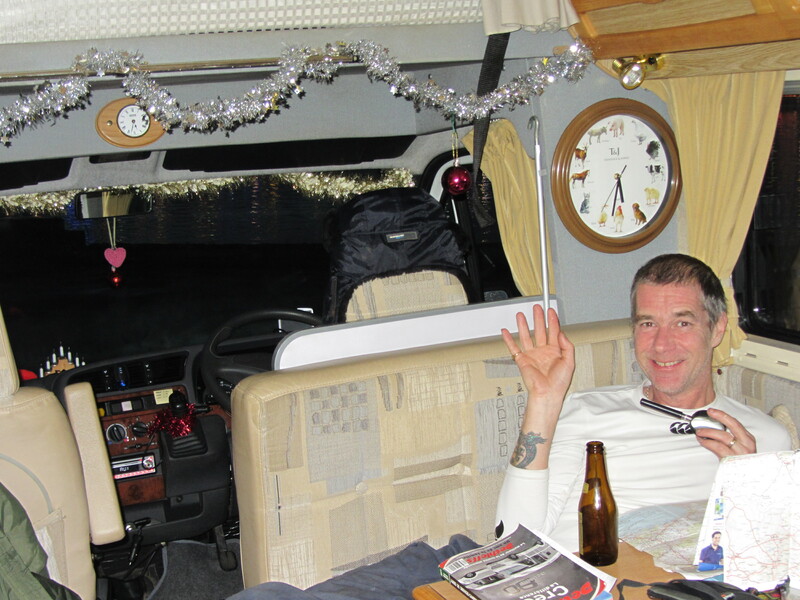 We have decided to move away from the river bank and we are actually parked in the ‘proper’ motorhome aire, right by the campsite, which is shut this time of year. The fee is still €3 a day, which usually includes electricity and water, except that due to the ‘ freezing’ weather the water supply has been cut off even though it is not cold at all, just wet. Still, we are not complaining as we have plenty of water and we can always fill up somewhere else when needed. 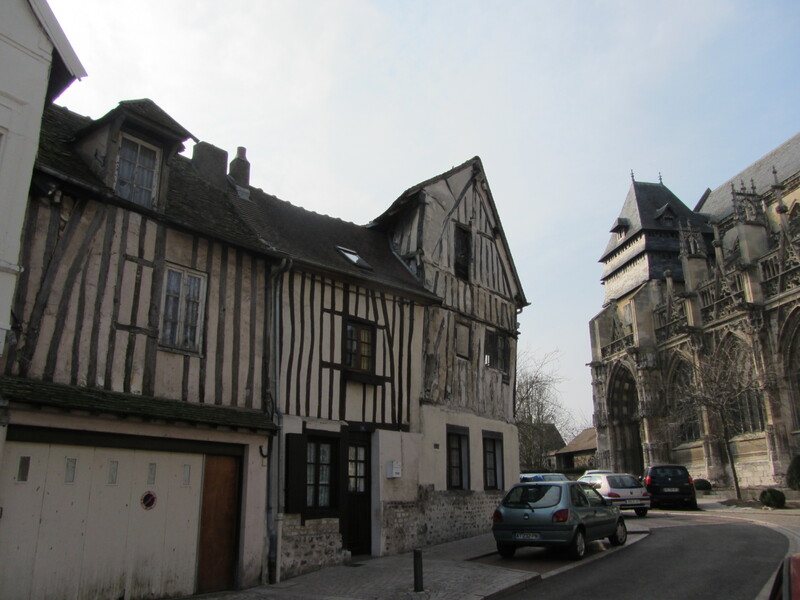 We’ve just been for a coffee and a beer in the village, followed by another dog walk along the river Sarthe and it feels just as charming and magical as the first time we came. 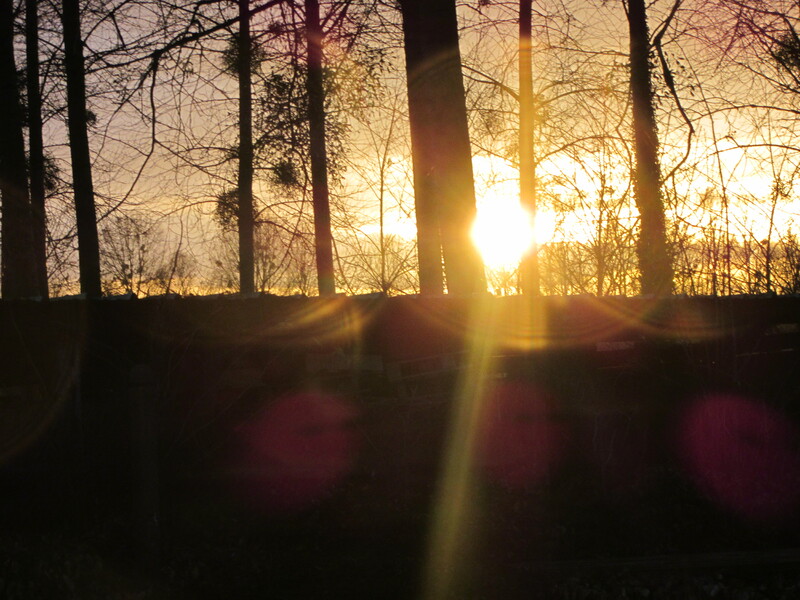 We are off to somewhere in the Loire tomorrow….